The Library hosted its first "Reading With Dogs" program on Monday afternoon, Oct. 23. The program, which will take place every Monday from 4-5 p.m. in the Children's Room, is designed to allow elementary school children to practice their reading skills by reading to a willing canine listener. The dogs belong to Ann Riley and her daughter Carine, a student at Takoma Park Middle School. The three dogs, who sport nifty "I Love Reading" jackets, will take turns listening to children read each week. 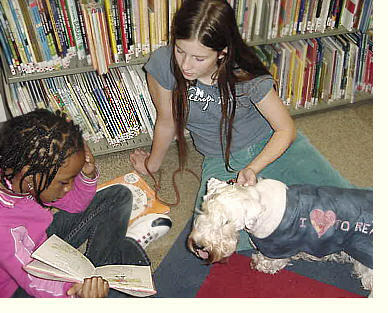 At our first program, Rosie the dog listened carefully as Jennifer, Ikenner and Lauren read stories aloud to her. The children, who each read 10-15 minutes, chose their own books, and Rosie seemed to enjoy their selections. There will be a sign-up sheet at the Library desk for any child interested in taking a turn in reading to the dogs on Mondays. Of you can call 301-891-7259 to sign up. Come and join us as we go to the dogs! We had our first monthly Spanish Storytelling Saturday on Oct. 7. The participants -- ranging in age from babies through senior citizens -- listened as storyteller Laura Kleinmann used a felt board and her considerable acting skills to tell a tale -- all in Spanish -- from El Salvador. Kleinmann, the media specialist at the Oyster Bilingual Elementary School in Washington, D.C., will present her program on the first Saturday of each month. The next program is on Nov. 4, from 10:30-11:15. No need to register, but do plan to come! The program is for all ages, and you don't need to know any Spanish to enjoy it, thanks to Kleinmann's highly visual storytelling style. 40 Readers and 343 Books!! The 2006 Summer Quest reading program, created and designed by Library staffer Dave Burbank, was a rousing success. We celebrated the program's end on Sept. 11, with a party attended by 35 kids and adults. Everyone got a prize, and Camden Roberts won the raffle, taking home a huge stuffed bear, which had been "living" in the Library's storage room. __Those 40 kids read a total of 343 books!! That's right, 40 kids and 343 books! __ The highest number of books read by one participant was 40. The second-highest number was 39 books, and the third-highest was 36 books. Look for an all-new Summer Quest program next summer! ¡Sábado Gigante para Niños en la Biblioteca! Vengan a la biblioteca de Takoma Park a disfrutar cuentos, libros y canciónes en espanñol para niños y niñas de todas las edades con la narradora de cuentos local Laura Keinmann. Los programas se llevarán a cabo cada primer sábado del mes desde las 10:30 hasta las 11:15. Las fechas del 2006 son el 7 de octubre, el 4 de noviembre y el 2 de diciembre. En octubre celebraremos el mes de la Herencia Hispana. Update Feb 2009: Tuesday Circle Times are now offered at 10 and again at 11. Spanish Circle Time is scheduled for Thursdays at 11. For ages 18 months to 5 years. First two Thursdays of each month at 10 AM. Songs, stories, play and dance. Led by a native Spanish speaker with a B.A. in education and Spanish. And remember English Circle Time - every Tuesday morning at 10.